Workers in industrial settings are exposed to dangerous working conditions on a daily basis. 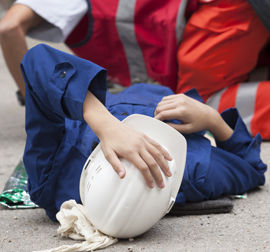 Even with the proper safety precautions in place, industrial accidents can still occur, seriously injuring or even killing employees. If you have suffered a serious injury or lost a loved one in an industrial accident, you have the right to pursue action against the responsible parties. At The Svambera Law Firm, PLLC, , in Houston, Texas, our experienced attorneys provide comprehensive representation in all industrial accident injury cases. They will carefully analyze the circumstances surrounding your injury, and seek full and fair compensation for your injuries.Contact us by e-mail or phone at 866-722-9288 to schedule a free initial consultation with a compassionate personal injury lawyer. Accidents in industrial and manufacturing facilities, such as oil refineries, are relatively common. Employees often have to climb to great heights, leaving the potential open for slips and falls off ladders or scaffolding. Workers may be exposed to toxic chemicals or asbestos on a daily basis. Explosions can occur, burning those unfortunate enough to be too close. The potential causes of industrial accidents are limitless. These injuries can seriously impact a victim's life. He or she may never be able to return to work. As a result, securing compensation for medical bills, pain and suffering, lost wages and other damages is of the utmost importance. To schedule a free initial consultation to discuss your industrial accident and resulting injuries, call us at 866-722-9288 or contact us online. We accept personal injury cases on a contingency fee basis, meaning you will not be responsible for attorney fees unless we recover compensation on your behalf. Damos la bienvenida a clientes que hablan español y contamos con representantes que hablan español con fluidez, quienes lo podrán asistir.